One of my all-time favourite TV cop/detective shows ran for only 13 episodes in 1990. One single series. And yet it had everything going for it. Based on a long series of novels by William Marshall (Marshall himself even wrote one of the TV episodes), set in beautiful Hong Kong and starring, among others, a young Mark McGann, Yellowthread Street should have been a huge hit. The basic premise followed the detectives of the fictional Hong Bay station in Hong Kong. The only character to appear in all 13 episodes was Chief Inspector Alex Vale, played by Ray Lonnen, who was well-known to TV viewers from being the eponymous Harry in the TV mini-series Harry’s Game a few years previously. 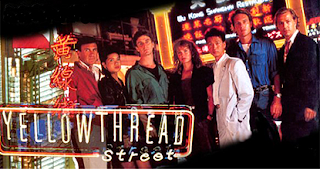 However the action centred more around the rest of the squad, with each episode featuring a different combination of two or three from the main cast solving cases in the gritty, crowded Hong Kong streets. The cast itself was a good mix, remember that Hong Kong was still under British governance at that point and, as well as Mark McGann, the other stars are recognisable from films and series before and since. For example Tzi Ma, Detective Eddie Pak in the series, had a recurring role in several series of 24 and Bruce Payne, who played detective Nick Eden, went on to star as Charles Rane in Passenger 57 (OK that’s maybe not a claim to fame but you know his face). So where did it go wrong? To my mind it was too far ahead of its time for what the majority of the ITV audiences wanted at the time, both technically and in content. It was one of the first TV series to use stereo sound instead of mono, meaning that the hifi speakers needed to be plugged into the TV to get full effect. It was also shot like a film, something almost unheard of for a TV series in those days, with long unedited tracking sequences that showed both the skill of actor, director and cinematographer and also showcased the wonderful Hong Kong backdrop of mean and moody neon lit streets. The plotlines were intricately complex and sometimes totally surreal, dealing with drug running, gangland crime and corruption, and that was just within the force, blurring the lines between good guy and bad guy as they did whatever they needed to to get criminals off the streets. Because of that the violence was also ruthless, physical, and the dialogue equally sharp with, although not laugh out loud funny, an undercurrent of knowing wit among the brutality. To be honest, it was basically Asian arthouse cinema without the subtitles. If done right, and picked up by the right production company who are brave enough to deal with it as is, this is one series that really could stand a remake.